Terrariums are increasingly popular houseplants, but arrangements can get expensive. My talented and crafty sister, Margaret, shared with us how to make beautiful miniature terrariums with succulent plants, so you can make your own arrangement! A terrarium is generally a transparent enclosure or similar container for cultivating plants. This version is not sealed, but is enclosed in a small container. Margaret’s interest in miniature terrariums started while browsing Pinterest. She opted for succulents, as they are a bit heartier than other houseplants. Their ease of care makes them a good choice. Margaret browsed the web for instructions on assembling her terrariums. Everyone has a slightly different way of doing things, so Margaret recommends you adapt her instructions based on what materials you can find. THE CONTAINER. Margaret used glass containers she had left over from flower arrangements. You can find vases like this second-hand at thrift stores or garage sales. Have fun finding containers in interesting shapes! 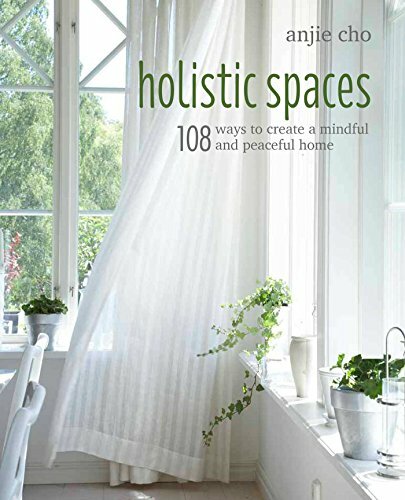 It’s helpful if they don’t have a lot of patterns on the surface of the glass, obscuring the view of your plants. 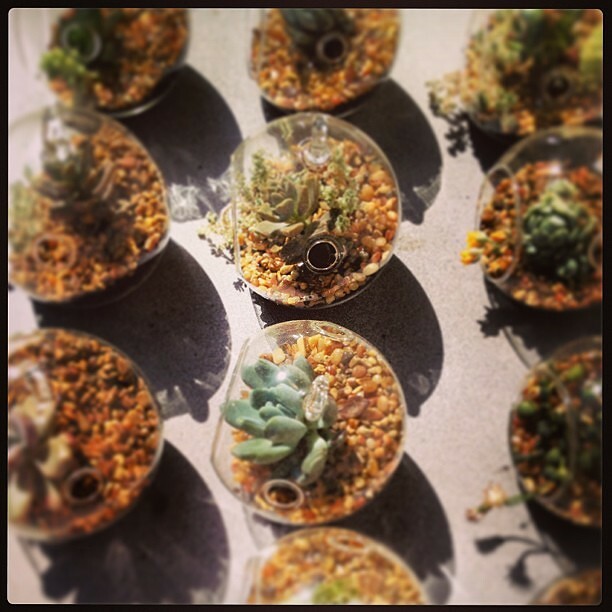 She also used hanging glass terrarium globes that were purchased online. They are easy to find as single pieces or in larger sets in bulk. Margaret prefers the flat bottom globes, they are simpler to travel with because they do not roll around. She also recommends the globes that are meant to be votive candle holders. The additional holes make it easier to water the plants. SOIL. Organic soil is always preferable to synthetic-chemically treated potting soil. Margaret recommends an aerated mix such as a cactus blend, rather than general potting soil. The cactus blend has more sand and rocks mixed in. She likes “E.B. Stone Organics” Cactus blend. If you can’t find an aerated blend, mix some porous rocks, such as perlite, into your mix. GRAVEL. Gravel is easy to find at a pet store or aquarium. Margaret opted for the neutral earth tones, but she’s seen people use colored glass, black or white stones, and even sand instead. The size of the gravel depends on the size of the container as well as your preference. If you’re using 4” diameter globes, a 3-5mm pebble size is appropriate. For larger container, you can use the smaller pebbles, or go bigger, like 10-16mm. ACTIVATED CHARCOAL. You can find this at your local pet store or aquarium too. It’s mixed into and used to filter the soil and minimize any odors. Any leftover activated charcoal you have can be used in a satchel in your closet or shoes, again to minimize unwanted odors. SUCCULENTS. Margaret suggests you purchase 2" or smaller sized plants at your local nursery. In NYC, I love Sprout in Brooklyn. You can also find varieties of small succulents on Etsy. Margaret’s favorite at the moment is the Echeveria, because they look like little roses and come in different colors. Avoid purchasing cuttings, which don’t have roots yet. Instead, look for potted plants with root systems. ADDITIONAL ITEMS. A spoon, mixing bowl, and soft bristle brush, such as a ½” wide paint brush. Finally, it’s time for the assembly! If possible, this part should be done outside to minimize the clean up. 1. CLEAN THE CONTAINER. It is a good idea to start with a clean container. It will get messy as we assemble the terrarium, but starting out clean keeps the cleaning you’ll do later to a minimum. The soft bristle brush is excellent for wiping off the dust. 2. MIX THE SOIL AND CHARCOAL. Combine 5 parts soil with 1 part charcoal, and mix thoroughly. Add water to this mixture; the soil should be moist, but not wet. How much water to add will depend on how dry the soil is to start with. We recommend ¼ cup increments. Add a little at a time; you can always add more water. If you overwater, just add a little bit more soil and charcoal. Make sure the entire soil mixture is combined well. 3. PREPARE THE PLANTS. Squeeze the outside of the plant container to loosen the soil and roots. Then tip the plant upside down and lightly pinch container until the plant comes out with the roots intact. Gently massage the root system, to release the loose dirt. The goal is to have the root system exposed and loosened, because there will not be enough room in the container for all the soil. 4. ADD GRAVEL. Now is a great time to rinse your hands off. With clean hands, add gravel to the bottom of the container. Margaret suggests using a spoon to ease the pebbles through the small opening of your container. Add about 1/2" layer of gravel for a 4" bulb. Then add a thin layer of charcoal on top of the gravel. This layer of gravel and charcoal will drain the soil, which is especially helpful if you overwater. 5. ADD SOIL/CHARCOAL MIXTURE AND PLANT. Next add a couple spoons of the soil mixtures into your container. Margaret likes to make a well for the plant to go into, with more soil towards the back of the container. Loosely wrap the root system into a ball, and gently place the succulent plant roots down into the soil. Move the soil around with your fingers to gently pack in the roots. At this point, you can add more soil as required to cover the roots. 6. FINISH OFF WITH SOIL AND GRAVEL. Once you have the soil level as you like it and the plants where you want them, spoon a single thin layer of gravel on top. This is decorative and also helps to keep the soil layer in place. Use the soft bristle brush to clean off any dirt and gravel from the sides of the container as well as from the plant(s). And voila! Your own beautiful miniature succulent terrarium! If you need some inspiration on the plant arrangement, check out Margaret’s Succulents Pinterest board. You can also look at Sprout’s gallery. Margaret reminds us that odd numbers tend to look best, but two can also work. Pay attention to the size of our container. And look around the web for inspiration! CARING FOR YOUR NEW TERRARIUM. Keep the terrarium in indirect sunlight. Although succulents love sun, because it's a terrarium, the heat gets amplified like the greenhouse effect. Lightly water your plants every two weeks, or as needed. 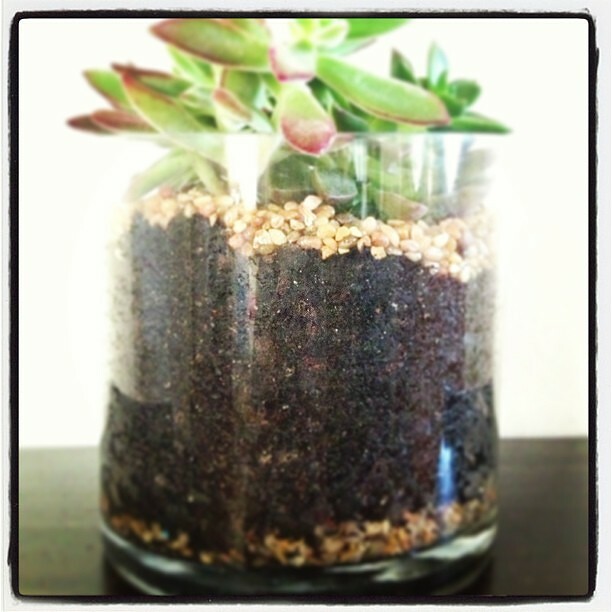 A good way to tell when using a glass container is to water when you start to see the soil turn light brown and dry. Be careful not to overwater! Remember that succulents need very little water.